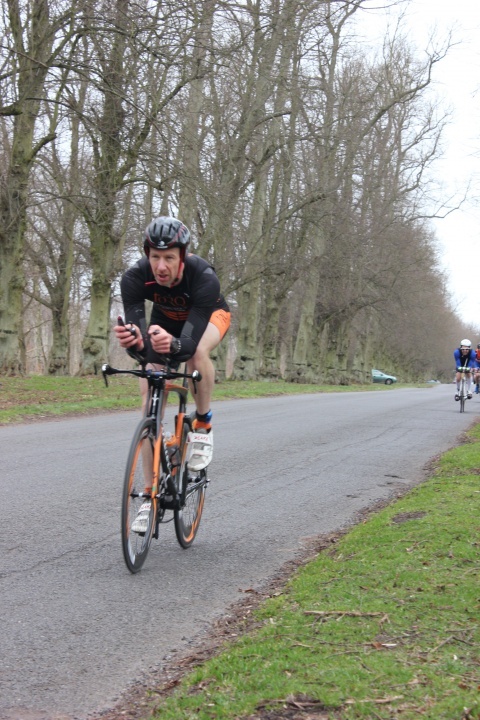 My first race of the 2015 Season was the British Age group Duathlon Championships at Clumber Park. 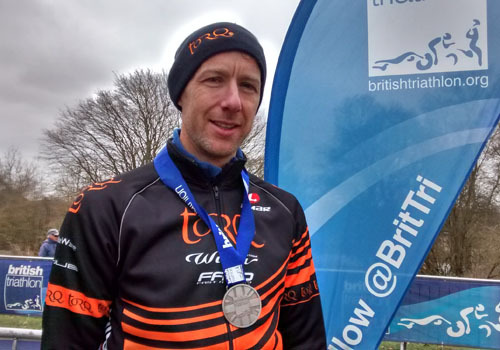 I was keen to compete in a couple of Duathlons prior to the Tri season starting, however, due to the structure of my training, I did not wish to place too much emphasis on these early season races. I had not competed at Clumber Park before; it is a lovely setting for racing, with closed road sections. Leading up to this event, it had been so Spring like and I was hopeful that the sun and warmth were going to hold. Unfortunately this was not to be the case, but at least it was dry. A high of 5 degrees was forecast, with some strong gusts. I don’t particularly like racing in lots of layers, so I wanted to get the balance right between not feeling too restricted on the run, but also not freezing on the bike. I headed out onto the first of two 5k loops, the group soon split up and by the end of the first lap a couple of people had worked their way clear. Although I wanted to stay in contention, I knew that this pace was a bit too fast and so I settled into my own rhythm. Although I was confident I would make gains on most people during the bike section, on our second lap, my main rival (Phil Melling), was pulling away from me. This I found unusual as our bike splits are normally very similar. I came into T1 in 4th place and was soon heading out on the bike; I was passing a lot of people, mostly from the wave in front. I then started having a few issues with cramp in my calves (this is something I have only found to be a problem when riding after running), so only sometimes applies to my Duathlons. After being buffeted by the wind for an hour and steadily getting colder, I was pleased to be entering T2. I felt I had a solid enough bike and was now in 2nd in my AG. Heading out onto the 5k run, I knew there was no chance of a win, but I wanted to make sure I held on to 2nd place. I tried to maintain my form through the run and finished in 2nd place in my AG and 9th overall. For an early Season outing, I was satisfied with this result. This had reminded me how tough Standard Distance Duathlons are. Going into the Clumber Park Sprint Duathlon, I felt my run fitness was right up there. However, my bike form tends to develop over the months (from March/April onwards), largely because a good deal of my Winter training is spent on the turbo. For this event, it therefore meant that I had no “real idea” of exactly where I would place. I tried to take comfort from the fact that I had already made the Duathlon podium (2nd and 1st in AG) this year at the Eton Dorney Sprint. 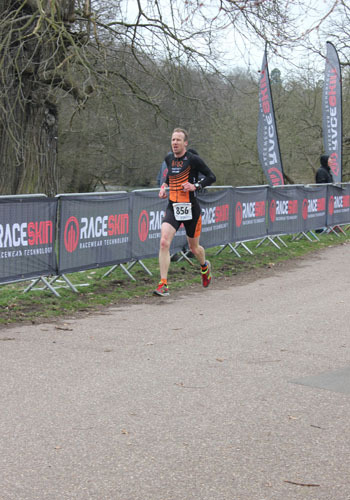 However, there was no getting away from the fact that this was Clumber Park, so pretty much the biggest Duathlon of the Season, where I knew the competition would be extreme. True to word, this turned out to be the largest Duathlon ever held at Clumber (with over 450 participants in the Sprint race and another 430 in the Standard race). The level of competition was heightened even further by this being not only the British Championships, but a European and World qualifier. From the start, my run form came from the fore and on the 2nd wave, I could really feel that I was starting to put pressure at the front, which meant I spent the last 4k (of the 5k run) leading the pack and putting distance into the entire field. A reasonably swift transition and out onto the bike. The first 5-7k went by well. 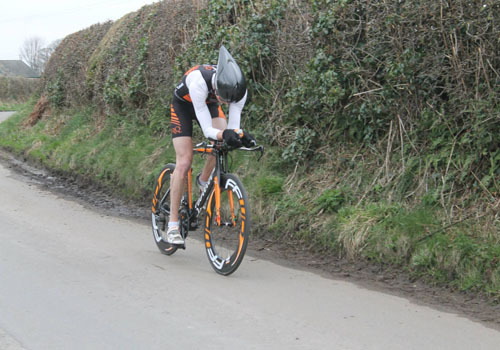 Thereafter, the extremely windy conditions blew my 10 stone body all over the road and made the journey back to transition more suited to pure time trial riders, hence several riders went past me in the last 10k of the bike. Fortunately, I regained my strong running legs and managed to obtain a podium spot (3rd) on the last 2.5k run. Overall I’d have to say I’m happy with the result. Indeed, probably my best ever finish at Clumber. Whilst still early doors in the Season, I’d been hoping for the British Duathlon Champs to go better than it did, a lot better. The Winter training had been as consistent and as good as any I can remember and I’d been hoping to be challenging near the top of the Age Group and overall. 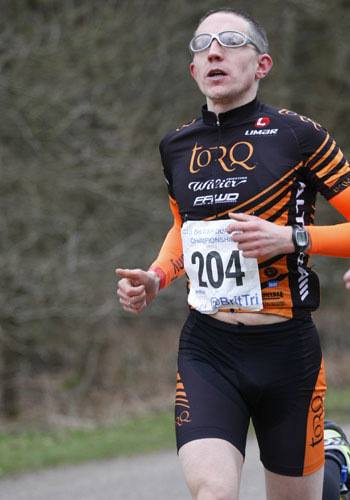 It was a strong field, which alongside a host of others, included 2014’s (and this year’s eventual winner) Julian Lings, who I just pipped to the win at the National Duathlon last year. 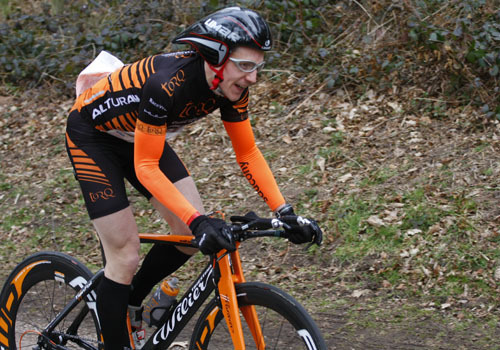 As the event was the British Champs, it was the first big race of the year and after dusting off the cobwebs at the NW Champs the previous weekend, I was optimistic. In the week leading up to the race, I’d been feeling pretty wiped out. I put it down to a bit of fatigue after last weekend’s win and some taper week blues. However, by Friday, I’d perked up and was keen for a challenging race. When the gun went off, all seemed good and I was comfortably running at the back of a small front pack of 4, but after only 2-3km things took a turn for the worse. Whilst every race includes various types of pain and discomfort, I knew something wasn’t quite right. Within a minute (and without any major change in pace or intensity) my legs and arms seemed to feel like lead, my heart rate seemed to shoot up and even my vision seemed to blur slightly (this is where I enter the @TriExcuse territory, but I’m still hoping for a retweet). That being said (as I seemed to go backwards), I could make out the backs of those who began to come past. I could or maybe should have stopped and saved myself what was inevitably going to be a disappointing result, and not the most enjoyable of races, but decided to carry on with a small hope that something might be salvaged. Out on the bike, things seemed to calm down a bit, but there wasn’t anything close to the kind of race day power or intensity needed. Sadly, the second run felt much like the first. Nontheless, I crossed the line, but rather than enjoy the satisfaction of a good race and the chance to congratulate those around you, I made straight for a portaloo. Not a race to treaure then, as there was clearly something wrong. Congratulations then to all those who raced well and to Iain for another AG podium and giving the team some good results for the day. So whilst I consider being 26th overall and 7th in the Age Group is a disappointing start to the season, I’m trying to treat whatever the problem was as an exception, as I accept that bad days happen. I am however still trying to piece together how and if the problem could’ve been avoided (thoughts welcome @lawtonalex). That being said I’m entered for next weekend’s Elite Duathlon and if I decide to race, the start list suggest that 26th may be a decent position.